Recording from individual cells in genetically identified populations is the hottest technique in systems neuroscience right now (I am, of course, totally biased since that's what I'm trying to do). To record from identified populations, you first choose a mouse line that expresses Cre driven by a cell-specific marker like D1R. Then you transduce those cells with floxed ChR2 or GCaMP so you can phototag or image them. Finally, you run the mice through behaviours while recording to see how the identified neurons respond. If everything works out, you can directly link identified neurons' activity with specific behaviours. There is, though, a catch-22 in interpreting these results. If all the cells respond the same way, then you have confirmed that your population is unitary, but the single cell nature of your recording yields no new information. On the other hand, if the cells you record from respond to a bunch of different things, they're not really a unified population, but rather a conglomeration of different neuron types. To illustrate these issue, I'd like to briefly show figures from two papers. If you stimulate AgRP neurons in the hypothalamus, you can get a mouse to shove chow in its face. What remained unclear until this year, however, was how these neurons fire naturally. Some evidence gave hints; cFos staining had shown that these neurons are more active in hungry mice; in vitro recordings have shown that in hungry mice, these neurons receive more excitatory input, a cool form of short-term plasticity (Yang, ..., Sternson, 2011); and imaging has shown that these neurons undergo rapid spinogenesis and pruning when mice are hungry and fed (Liu, ..., Lowell, 2012). In general, the working hypothesis was that AgRP neurons fire at a high rate when a mouse is hungry, which causes a mouse to seek food, or eat; when a mouse is sated, AgRP neurons turn off. Given that basic model, there were many unanswered questions. How fast do AgRP neurons turn on and off? Do they turn off when you start eating, or do they take time to integrate enteric (gut) signals? What rate do they fire at? To answer these types of questions, we needed the development of easier in-vivo recording techniques for deep brain areas. Earlier this year, the Knight lab at UCSF answered many of these questions by doing fibre photometry of AgRP and POMC neurons expressing GCaMP6s. (Chen, ..., Knight, 2015). They found that the activity of AgRP neurons in hungry mice actually decreases before mice start eating, when the mice first sense food (see below). In addition to receiving gut information, AgRP neurons receive fast input from brain areas that can identify food, which was unexpected. These results also question whether AgRP neurons are "hunger" neurons, or something slightly different like food seeking neurons. AgRP neurons decrease their activity when mice see food. B. When a hungry mouse sees food (red trace), AgRP neuron fluorescence decreases. When it see an object (black trace), the neuron does not change activity. C. Summary of AgRP neuron fluorescence changes in fasted and fed mice responding to objects and chow. Only fasted mice that see chow decrease fluorescence. From Chen, et. al., 2015. Even knowing how AgRP neurons respond on average, it is possible that individual AgRP neurons respond differentially due to differences in protein expression or projections. AgRP neurons express variable levels of metabolic receptors like insulin or ghrelin, which could influence firing. Subsets of AgRP neurons project to different brain regions without collaterals; stimulation of some of these projections induces feeding while others do not, implying functional differences. Given these differences, it's possible some AgRP neurons respond to food cues, while other respond to enteric signals. To answer these questions, you would need to record from single cells. Fortuitously, the Sternson lab did just that, using an in-vivo endomicroscope to image individual AgRP neurons expressing GCaMP6 (Betley, ..., Sternson, 2015). They found that all AgRP neurons act pretty much the same. 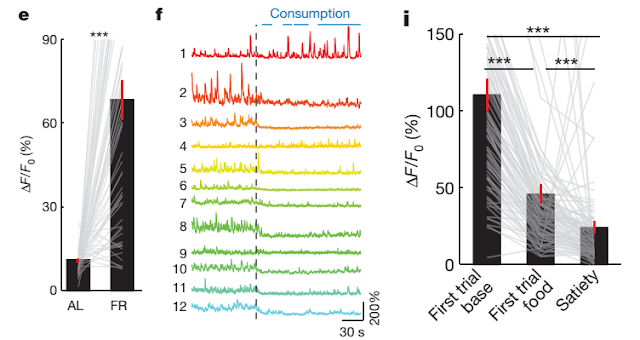 They quantified fluorescence changes from AgRP neurons when a mouse was well fed, or food deprived; 54/61 neurons had brighter fluorescence when the mouse was food deprived (panel e, below). Like Chen et. al., they found that AgRP neurons decreased their activity before the mice started to eat (panel f); 96% of them to be precise (panel i). AgRP neurons have higher activity when a mouse is hungry. e. Magnitude of fluorescence events for ad-libitum (AL) and food restricted (FR) mice. f. Single trial fluorescence traces from neurons during consumption. Most neurons decrease their activity before food is consumed. i. Magnitude of fluorescence before eating, after eating for one trial, and during satiety. 96% of traces decrease between the first trial base and first trial food. From Betley, et. al., 2015. I can tell you from personal experience these experiments are not trivial. The pessimistic interpretation of these results is that the technical prowess did not yield any new information. In talking to colleagues, however, that is probably unfair. Since we know that stimulation of different subsets of AgRP neurons can elicit different behaviour, the uniformity of their responses is surprising. This creates the question of how subsets of neurons which express the same protein and respond to the environment in the same way can elicit different behaviour. In contrast to all the neurons acting the same, there is the possibility that all the neurons act differently. To illustrate this, I've selected a recent paper from the Stuber lab at UNC which investigated GABA neurons in the lateral hypothalamus (LH; Jennings, ..., Stuber, 2015). They used an in-vivo endoscope to image Vgat-Cre neurons expressing GCaMP6m. They had previously shown that these neurons are involved in consummatory behaviour. During imaging, they ran the mice through two sets of behaviours. First, they let the mice eat in a cage with food located in two corners. If neurons had increased activity in the food zone, they were categorized as food zone excited (FZe); if they decreased activity, they were food zone inhibited (FZi). Around 10-15% of neurons were FZi or FZe (panel F, below). In a second set of behaviours, the mice were taught a progressive ratio task (PR3) where they could nose poke for food. Here they found some neurons responded during the nose poke (23%), while others responded during the consumption of food (10%; panel H, below). Finally, one might imagine that FZe or FZi neurons were correlated with nose poke or consumption activity, so they investigated the overlap between these populations. 28/40 FZe neurons responded during the PR3 task, split between consumption and nose poke; 12/40 FZi neurons responded during the PR3 task, again split between consumption and nose poke (panel J). LH GABA neurons do all sorts of stuff. F. Histogram of change in neuronal activity when a mouse enters a food zone. H. Venn diagram of cell responses during PR3 task. J. Overlap of FZe and FZi responses with PR3 responses. There does not appear to be a consistent pattern of activity either in the tasks individually, or across tasks. Our data suggest that separate subsets of appetitive-coding and consumption-coding ensembles exist within the LH GABAergic network. Thus, the LH GABAergic network can be viewed as a mosaic of functionally and computationally distinct cell types, requiring further definition. Nevertheless, these important computational differences among individual LH GABAergic neurons would have gone unnoticed if only bulk neuromodulatory approaches were employed, further underscoring the necessity of identifying the natural activity dynamics within a network to better understand the precise neural underpinnings of complex behavioral states. The pessimist in me is frustrated by these results. Now we have to track down the neuronal subtypes, and repeat the experiments for each subtype (and lord knows I hate repeating experiments)! On the positive side, this could be a building block for future experiments. There is now a lower bound for the number of cell types to look for (at least five). I think single cell sequencing is the only way to identify these cell types reliably, and without recording. Anyway, that is a long way of getting at what I see as the catch-22 of single cell identified neuronal recording: if they're all the same, you didn't need single cell resolution; and if they're all different, you don't have an strongly identified cell type. I assume for the first case, these neurons may project to different areas? Or perhaps release different peptides! Yup, subsets of AgRP neurons project to different brain regions, and stimulation of the fibres only some of the regions yields face-stuffing behavior. For peptides, it's thought that AgRP overlaps with NPY by >90%, but not much is known about other peptides. A couple labs are doing single cell sequencing to address this. There is also a developmental switch where some POMC neurons switch to AgRP (or vice versa), but not all AgRP are derived from POMC, which is another potential source for diversity.